In recent quarters, we have seen a change in the laptop landscape of Intel and Realtek networking options. A few OEMs, particularly Dell, are now implementing Killer networking on devices such as the XPS line of notebooks and their gaming PCs. However, given the gaming roots of the Killer design, it perhaps seems out of place to put a Killer network port into a more business/enterprise aimed device like an Inspiron. To that end, Dell and Rivet Networks have implemented a solution offering the software optimization mechanisms that Killer has developed for select Dell Inspiron models in a package called SmartByte. At a high level, this is prioritization software aimed squarely for Dell’s business customers and moving to make video the higher priority for network traffic, especially when other software is using the network. 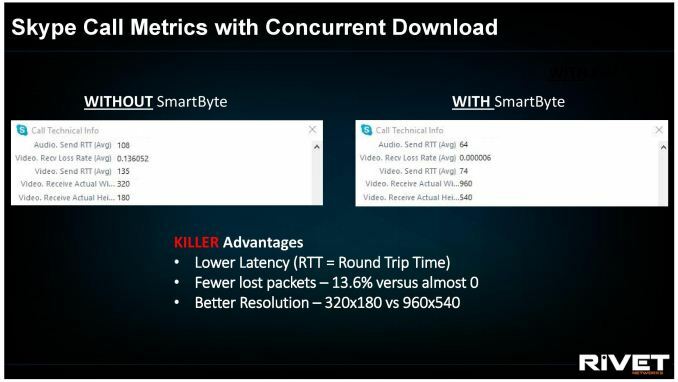 In the metrics given for the software, it was claimed that with a concurrent download in place, whereas a base system would only offer a 320x180 Skype video call with 14% lost data packets, with SmartByte in place the system could support 960x540 video with zero lost packages and a 40-50% lower ping. 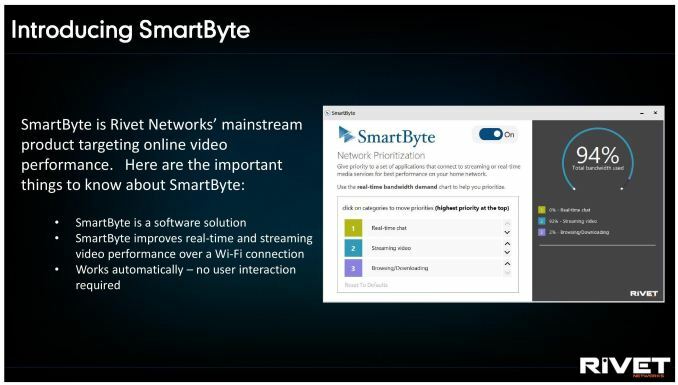 Similarly, when trying to stream video online while hitting the limit on an internet connection, the SmartByte software should give zero stream freezes. The SmartByte software is designed to work on both Intel and Realtek networking options offered in the Inspiron range, which leads to one obvious question which I put to Rivet Network: if you can do this all in software, why bother offering a physical Killer network solution at all? We were told that the physical solution allows for greater offload and packet examination, both freeing up resources and reducing latency, as well as tracking metrics better for optimization and a few other internal tweaks. 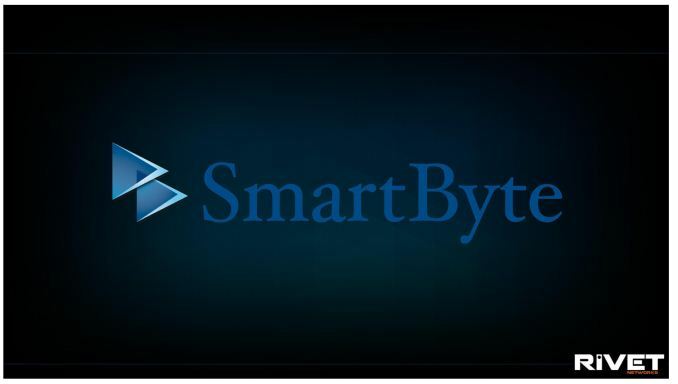 The SmartByte software works primarily for video only, and will only work for select system IDs (so there is no instance to install on other machines). Rivet stated that the requirements for this software were for it to be simple, as in ‘one-button’ simple if a user wanted to disable it for some reason. We were told to expect to see some Dell announcements in the coming weeks and months, with mentions of SmartByte in the marketing materials.